A primer on all campfire basics. As the nights grow long, as dusk creeps in, as the weather brings a chilly nip in the air, it becomes the perfect time to gather with family and friends around a campfire. Campfires bring special moments into ordinary days. Giving us a chance to pause, gather, visit, laugh, sing, and reflect. The smell of wood smoke hovering through crisp autumn air matches the sound of leaves crunching under your shoes. 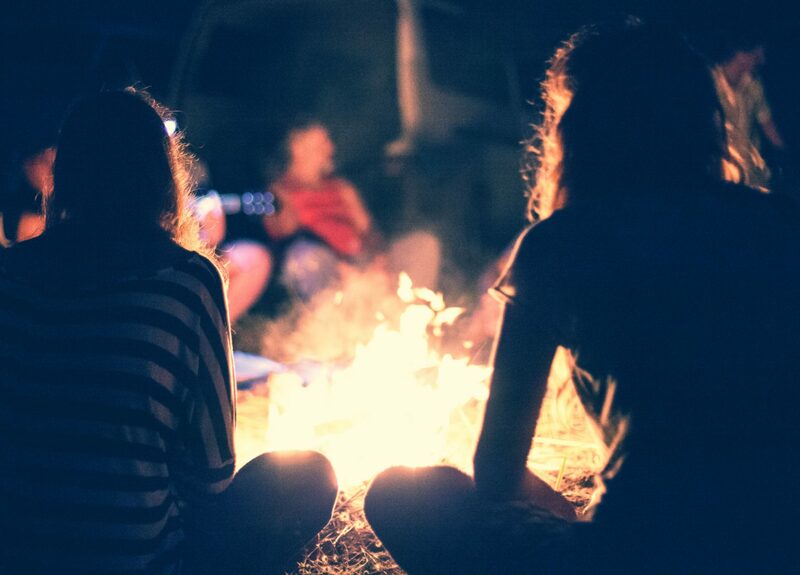 Follow the ideas and basics below to make the most of your campfire moments. 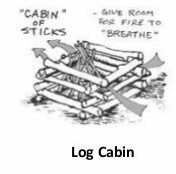 Loosely build your fire structure. 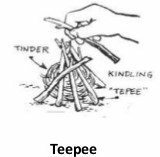 The teepee or log cabin configurations always work best for me. Light your fire. Gently blow air on the tinder/kindling to help the flames take hold. As the fire burns, move the embers to the middle of the fire to burn them completely. When your evening is complete, gently sprinkle water over the embers, stir the embers. Continue until the fire is out and the ashes are cool to the touch. Be certain that your fire is completely extinguished before leaving the area. If you are not in a campground, or you want even more information, REI has a great primer on building campfires. Light snacks are always welcome as you sit around the fire. Popcorn—This is easy to make in advance and bring along with you. Or if you want to try to pop it on the fire, find out how here. It is fun and a great addition to marshmallows and hot dogs. (I might make some in advance anyway, in case popping is problematic) Provide some great mix-ins like pretzels, M&M’s, raisins, nuts, dried fruit, coconut, bacon, cheese cubes. Munch and enjoy. Hobo soup – Build your fire with a grate for cooking. Place a heavy-duty pot on the grate. Have each person bring a can of soup. Open all soup and pour them all into the pot. Heat through, add water if necessary. Rinse cans and serve soup directly in the cans* with a spoon. This is a fun and tasty way to stay warm. *Watch for sharp edges on the cans. S’mores — I don’t know how you have a campfire without these fun treats. But to bring some new fun to the traditional flavor, try these ideas to create flavor-filled combinations. In fact, provide a combination of these and have a “cooking” competition to see who can come up with the most flavorful combo. Use different chocolate bars such as peanut butter cups, sea salt caramel, dark chocolate. Add fruit to the mix. Sliced strawberries, peaches, pineapple, oranges, apples can all make combinations that are different and tasty. Remember the benefits of connection with some fun games you don’t play every day. Telephone – An oldie but a goodie. And great for groups of 8 or more. In addition, all ages can play, and generational differences can add a variety of different cultural references to the game. To Play: A person quietly whispers the message to another person. This secret message is passed from one person to another until the last person announces it to the entire group. Thanks to the errors that usually arise in the retellings, hilarity usually ensues. The Winking Assassin — A great game to play with pre-teen and up. To Play: One player is the Godfather. Players close their eyes and the Godfather secretly taps one of the other players on the shoulder. This player becomes the “assassin.” Everyone opens their eyes and begins to wander around chatting. The “assassin” secretly winks at players. As soon as someone is winked at, they must sit down, and they are out of the game. When someone thinks they know who the “assassin” is they say, “He/She’s the winker!” But if they are wrong, they are out of the game. The winner gets to be the Godfather for the next round. Campfire Songs – Silly songs are a campfire tradition, if only for an excuse for excessive bad singing in silly voices. If you can’t handle 99 Bottles of Beer on the Wall, try these fun, quick songs. o Do-Do-Run-Run – I always like this song because the hook is so fun to sing. And if you are creative, it also lends itself easily to lyric improvisation. Full Lyrics here. Spooky Scary Stories – Later in the evening, a spooky story will leave you with chills from more than just the temperature. Find a great list here.